about you is your smile! Our dentists in Leesburg, VA and our whole team are on-hand to provide excellent family dental care. Whether you need that all-important first visit for your young child, braces or Invisalign for your teen, or cosmetic and implant dentistry for you or anyone in your family, we are here for you. We have sedation dentistry to help get past any anxiety, and with our $139 “No Insurance, No Problem” savings plan, we help your bank account as well. 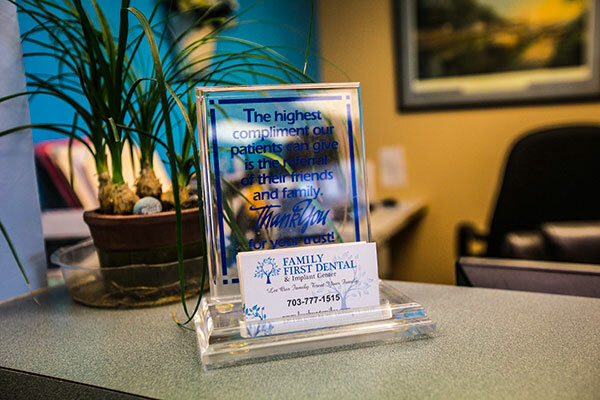 At Family First Dental & Implant Center, our name says what we do. We are a dentist office that puts your family first. Whether you just need a simple cleaning and exam that everyone should get every six months or have a dental emergency and need to be seen right now, we can help. We proudly serve Leesburg, Ashburn, Loudoun County, Clark County, and more with patient-centered care, emergency services, and comprehensive dental treatments for everyone in your family. Putting Family First Isn’t Just A Slogan. Our Leesburg, VA dentist proudly serve families from Leesburg, Ashburn, Loudoun County, Clark County, and more with modern, comprehensive dental treatments. We have seven highly trained dentists on staff, and with our incredible support team, we are ready to become your family’s dental office for years to come. Being a true family dental office means we see people of all ages. We would love to see your child for their first visit to the dentist’s office, and we know how to make that experience useful but fun so future visits can be less problematic. We offer orthodontic treatments like braces and Invisalign for teens and adults who need to fix crooked teeth. Our dentures can be securely held in place with dental implants or even special mini dental implants designed for patients with jawbone recession. And of course we offer the dental cleanings and exams everyone needs to keep their teeth and gums healthy. Living with a dull, crooked, and ugly smile is tough. How can you feel confident when you fear people will make fun of you behind your back once they see that horrible smile? That’s why more and more people are turning to cosmetic dentistry. We can use PureWhite and KöR Whitening to remove stains from your teeth, repair chips with tooth contouring or teeth bonding, use DURAthin or Lumineers dental veneers to cover and seal any stains and damage, or give you a complete smile makeover. Missing teeth is really two problems in one. First, it makes your smile look embarrassingly bad. But it’s also a health hazard, as jawbone can deteriorate and food particles can get stuck along the teeth next to the gap, leading to gum disease. If you need one tooth replaced, a dental implant is perfect because it uses a natural-looking replacement tooth and helps keep your jawbone healthy. And if you’re missing a lot of teeth, our All-on-4 implants and dentures with implants can do the same. We also use mini dental implants for patients who are not candidates for traditional dental implants. At Family First Dental & Implant Center, we are dedicated to providing excellent dental care for your whole family. For more information about how we can help your family get beautiful, healthy teeth, or to schedule your next appointment, call our Leesburg, VA dentist office today at 703-665-5488 or use our convenient online form.